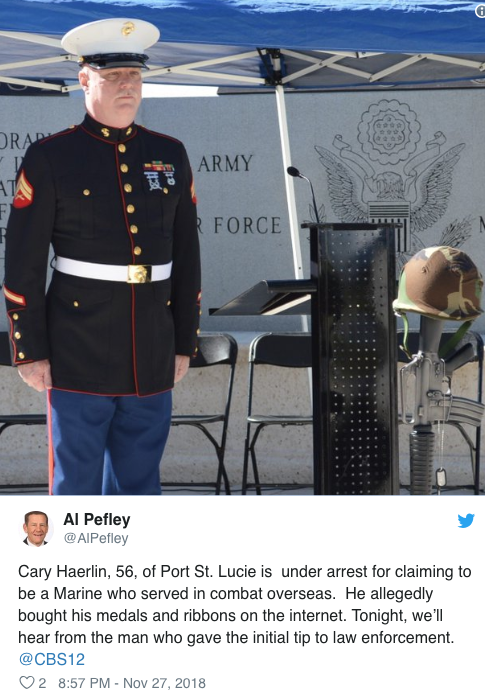 PORT ST. LUCIE, Fla. (CBS12) — A Port St. Lucie man is accused of posing as a decorated combat U.S. Marine veteran who served overseas. This case started a few months ago, when sheriff’s detectives got a tip. The tip came from a real U.S. Marine veteran who says he had information that bothered him so much, he had to go to law enforcement. “It is a shame, in every sense of the word. It’s a shame,” said Robin Barker, a Port St. Lucie resident. Barker spent two years in the Marine Corps in the 1970’s. He’s the man who went to the St. Lucie County Sheriff’s Office and provided a tip that led to the arrest this week of 56-year-old Cary Haerlin. “When I realized over a period of time that he was a master at deception, I wasn’t gonna let it go,” he said.